Understanding text features can help improve students' comprehension of a nonfiction text significantly. When I work with my struggling readers, I make sure my students understand not only what the different text features are, but what their purpose is. Students need to know how to use these text features to understand what they are reading. I will admit that in my own reading I have often skimmed over these critical features of nonfiction articles, but since working on this skill with my students, I have become much conscious of the effects of text features. 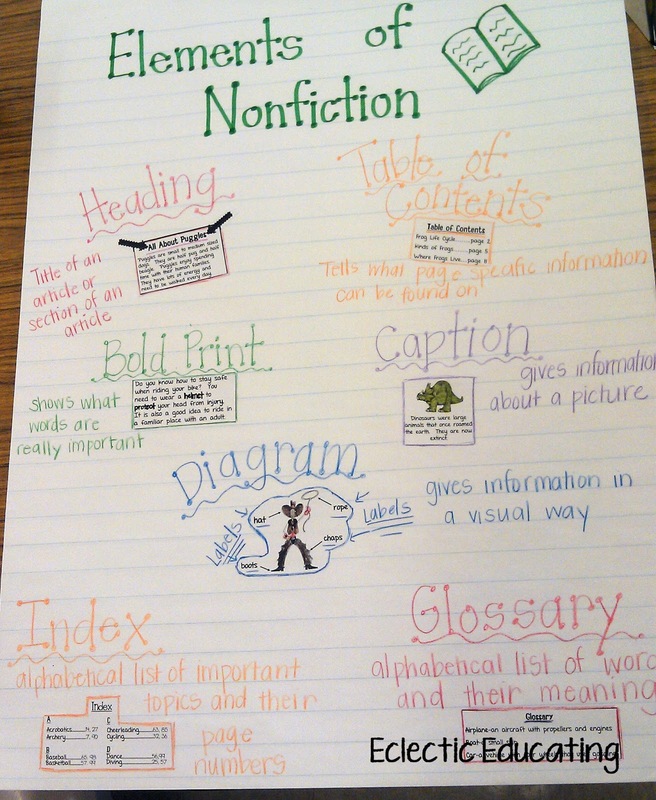 In a previous lesson, I had explicitly gone over the different types of text features found in nonfiction using the anchor chart above. At that point, my students were aware of approximately half of the terms. Throughout the year, we have continued to discuss these text features when they appear in our reading. My students quickly became accustomed to using the table of contents, glossary, and index. They also understood that bold words were very important words, emphasized for a reason. Unfortunately, my students often continued to skim over diagrams, captions, and headings. I decided it was time to draw my students' attention back to these "forgotten" text features. 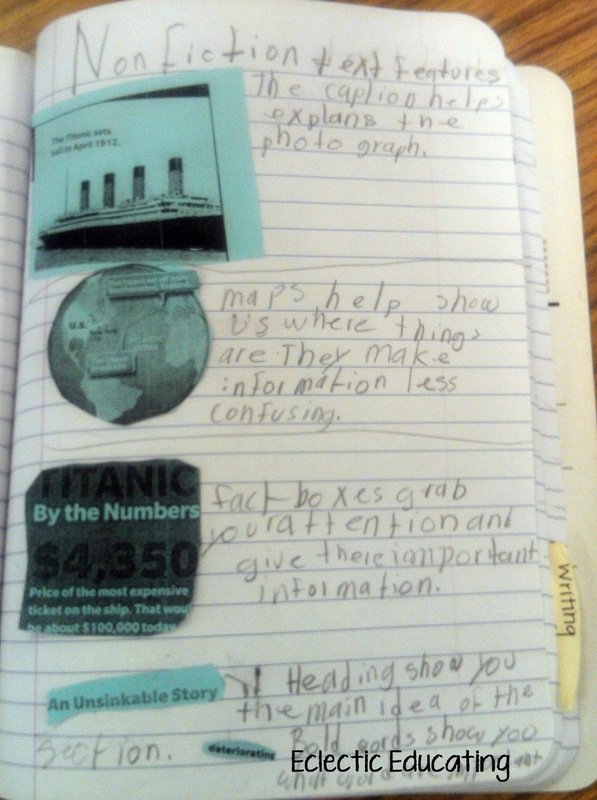 To do this, we began by reading a short nonfiction article about the Titanic. I chose this particular article because it was loaded with a variety of different text features. After reading and discussing the article, we began dissecting the text, literally. We went through the different text features and cut them out of the article. 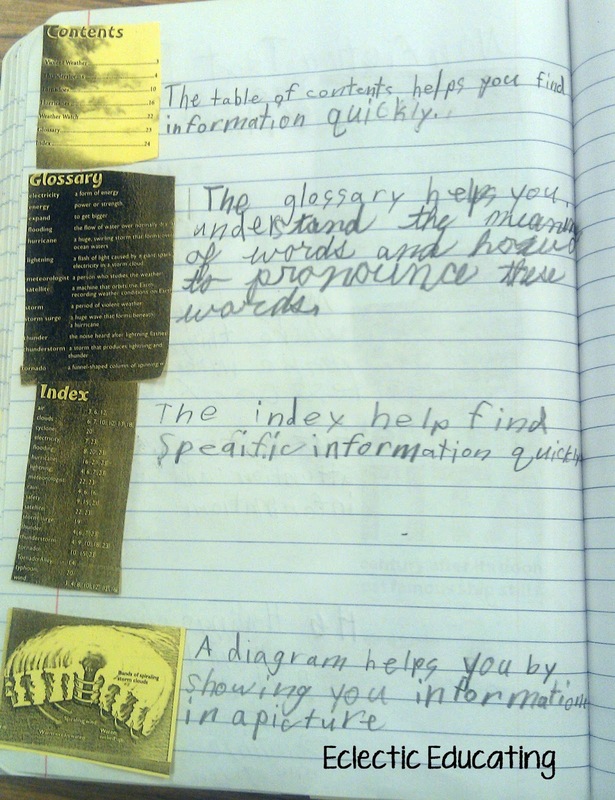 We then glued the text feature into our reader's notebooks. Next to the text feature, we wrote an explanation of why that specific text feature was important and how it was useful to us as readers. For our next nonfiction text, I selected a book about different types of severe weather. I thought the subject matter was fitting for this time of year in the Midwest. I made copies of the different text features, since we couldn't cut the book up. Just as with the previous text, we recorded why each particular text feature was important and how it was helpful to us as readers in our reader's notebooks. My hope is that this explicit review of text features will make my students more aware of text features in their reading. 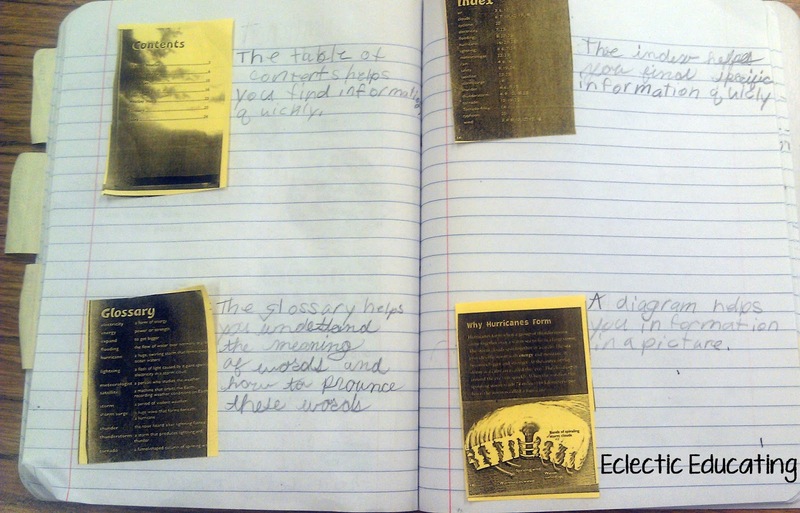 This use of text features will then lead to improved comprehension of nonfiction. How do you make sure your students are making good use of text features in their reading and not simply skimming over them? Cute anchor chart and great idea! 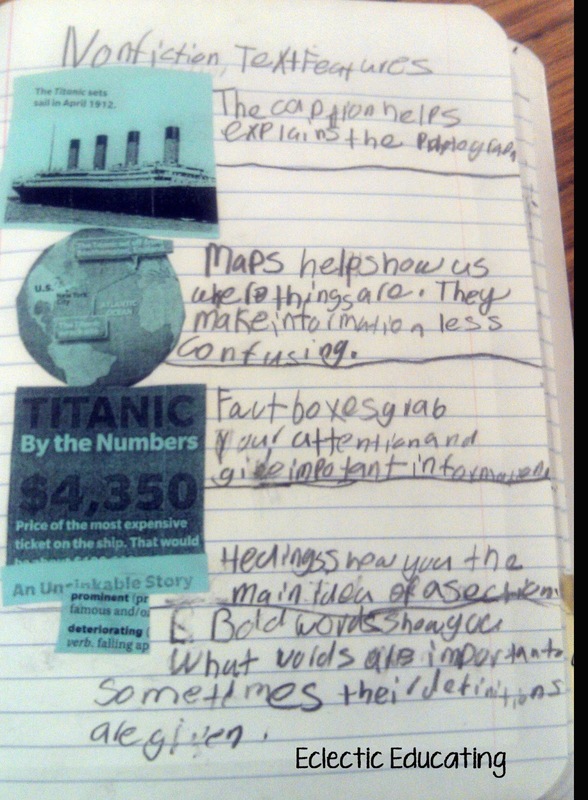 I cut up an article for our anchor chart, but I think next year I'll have the students do the same for their notebooks. Thanks for the idea! It seems we can never revisit those features enough. They are so helpful to them as readers and learners!